We've all had problems with our pre-workout supplement turning hard or clumpy before...but you can fix it! 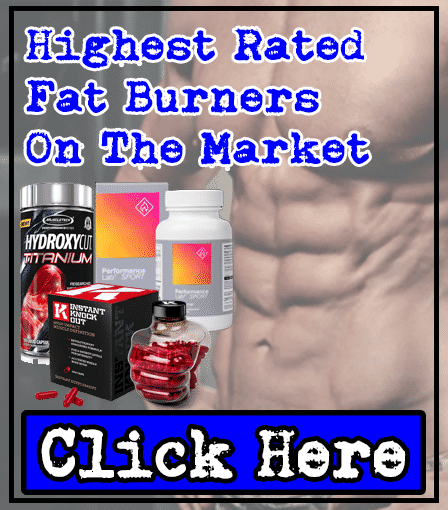 If you look on bodybuilding forums online, one big re-occurring problem that you'll encounter fellow weight-lifters having is this: their pre-workout going hard or clumpy. So it's no coincidence that almost everyone has this problem. In fact, you might have regretted buying a certain product or brand after this has happened. 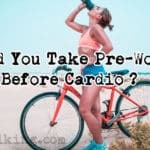 Only to go and try a new pre-workout and have the same problem - so what's the cause of hard or clumpy pre-workout powder? This is exactly the answer that we're going to provide in this article. But we'll also give you some fool-proof ways to try and avoid this problem from happening in the first place. Why do pre-workout powders turn clumpy or hard? 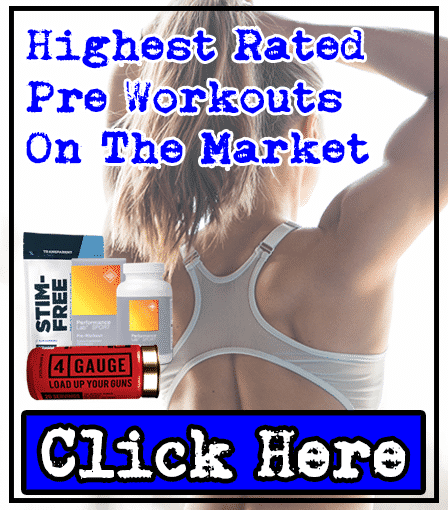 Why Does Pre-Workout Powder Turn Clumpy or Hard? Right, so your pre-workout supplement arrived in a solid block or it began turning clumpy or hard somewhere along the line. Either way, you're here looking for answers. This has been the most common reason why our pre-workout powder has turned clumpy or hard. If you leave it unused for ages, then it'll just sit there - most likely taking in moisture from the air, without being stirred around. Think about it. You use your protein powder much more than your pre-workout, right? Well, that means your protein powder is constantly being mixed around in the tub, making it much less likely to solidify. As a result, if you've not used your pre-workout for a couple of weeks, then open it up and give it a quick stir to keep it from turning into a solid block. This should be one of the most common mistakes made by most lifters. You should never leave your pre-workout supplement in the car, especially on a hot day. Why? Because it'll increase the pre-workout powder's chances of drawing in as much moisture as possible - resulting in hard or clumpy pre-workout. In fact, looking through bodybuilding forums, this seemed to be the #1 cause of this problem. Ultimately, if your pre-workout has turned clumpy or hard after leaving it in the car, then it wasn't a co-incidence. Don't do it! This is an absolute rookie mistake to make. You might not have known what that little packet was in your pre-workout container was there for and took it out. For whatever reason, if you've removed your silica gel packet from your pre-workout container, you've effectively increased your chances of having hard or clumpy pre-workout powder. Why? Because silica gel packets are literally designed to absorb moisture and keep food or powder dry. Right, so you've eaten your starter and now you want your main course. This is the section that you came here to read. You're going to feel like it's Christmas too; instead of giving you one 'fix', we're going to give you numerous different solutions to help you revive your hard or clumpy pre-workout supplement - to make it usable again and save you from having to buy more products necessarily! *Disclaimer: These are just options that we've tried personally. Don't take this as medical advice or anything like that, and ultimately you'll be trying any of these options at your own risk. We found this fix in numerous bodybuilding forums online. Almost everyone recommends you to throw your hard or clumpy pre-workout in your blender - pretty logical right? Well, does it work? Yeah, it works! Our pre-workout was back to powder form after less than a minute in our blender. And we've actually fixed a few different pre-workouts using this method. As a result, just make sure that you have an effective blender that'll seriously get the job done. If you're not confident in your blender's ability to fix your concrete brick of pre-workout, then you might be interested in our other ultimate fixes. 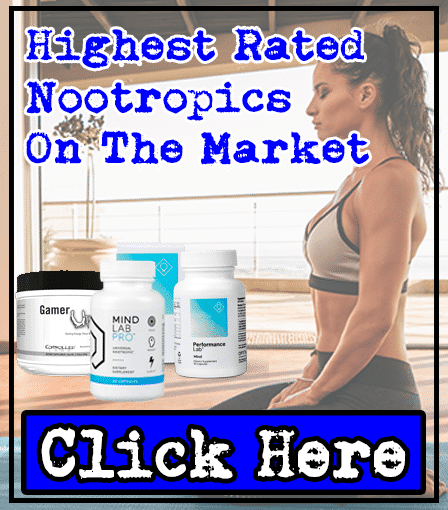 If you don't have a blender or are worried that you're going to break your blender with your hard or clumpy pre-workout powder, then this is the fix for you. It's pretty self-explanatory. Grab a fork and start breaking up your powder until it looks like it should look. Or until it's loose enough for you to scoop out accurate servings from. Before you start complaining, you might not be able to get your pre-workout looking like fine powder again. So you'll have to just settle for being happy with slightly clumpy pre-workout powder with this fork option. Also, this is going to take more muscle to achieve - but you go to the gym for a reason, right?! We saw this idea in a bodybuilding forum too and we were pretty skeptical at first. But it actually works - it does take much more effort than the other 2 options though. What do you do? Well, we began by adding enough water to fill your container, so the water level is just above the solid or clumpy powder. After that, we left our powder to dissolve in the water, adding more water when necessary (we left it in our fridge during this process). Eventually, we were left with liquid pre-workout. At this point, we grabbed our ice cube tray, filled that bad-boy up, and placed it in our freezer. 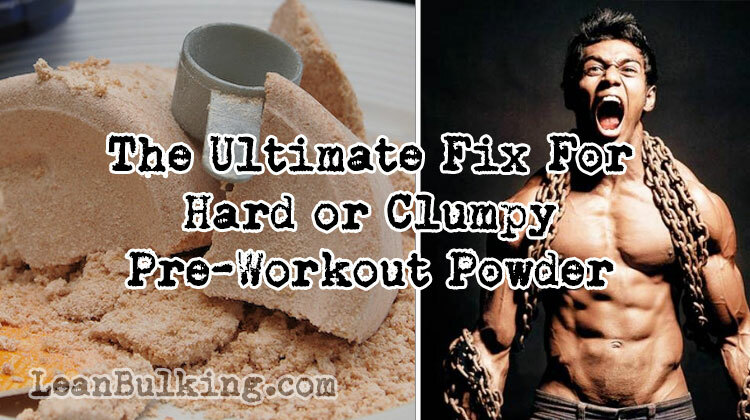 Hard or Clumpy Pre-Workout Fix #4: Chew The Clumps! This is a really 'last resort' fix. 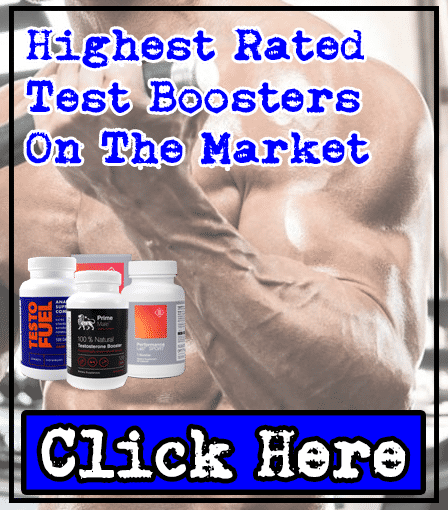 Basically, if you've failed to really fix your pre-workout supplement and it's still really clumpy, then just grab a chunk and chew it; this was also quite a popular option in bodybuilding forums. But the main issue with this is that you won't know the exact dosages or serving size you're consuming. So you might consume more caffeine or nutrient in your pre-workout than you want to. So, we can't really recommend this option either. But it is a option - try this at your own risk! As we mentioned, many people remove the silica packets from their pre-workout containers. This inevitably increases your chances of your pre-workout powder turning hard or clumpy. However, adding a slice of bread (or some dry rice) inside a small open plastic bag, inside your pre-workout container can help fix the issue; this is because the slice of bread (or rice) should draw the moisture away from the powder. We always place a focus on choosing products that have a great brand behind them. Sometimes having that great customer service can really pay off, and you want one that will be willing to solve your problems for you. Clumpy or Hard pre-workout can sometimes be hard to prevent. 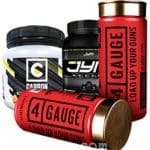 If a pre-workout has been in a warehouse for a long time before reaching you, then there's not a lot companies can do about it. However, the best companies should be prepared to replace your hard or clumpy pre-workouts for you; we've personally had great assistance from the Roar Ambition team, as they replaced 1 4 Gauge bottle for us, free of charge, after a bottle arrived rock-hard. Of course, you'll have to send clear pictures of your rock-hard 4 Gauge, and we received a refund only after we couldn't blend them up (we've only had to do this once after buying 4 Gauge consistently for 1 year)! We've seen that some other companies are wiling to do this too, after checking on bodybuilding forums. But don't go looking for free products, this really should be a last resort. One thing that everyone should be doing is trying to prevent their pre-workout powder from turning hard or clumpy in the first place. A really popular option on bodybuilding forums is keeping pre-workout supplements in fridges. This makes sense, because it'll keep your pre-workout powder cool and dry at all times; it's believed that your pre-workout powder draws in moisture when it's in warm environments. After seeing this on forums, we've been keeping our pre-workout in our fridge since. And we can agree that it definitely helps! A great option is adding a second silica gel packet to your pre-workout container; this is if you have one spare, or you can buy them from Amazon for pretty cheap too. Or if you don't want to buy some more silica gel packets, then just add some uncooked rice in an open bag into your pre-workout container instead. Either way, both options will help keep your pre-workout powder from absorbing excess moisture, which prevents it from turning hard or clumpy. We mentioned earlier that leaving your pre-workout on your shelf for months increases its chances of turning hard or clumpy. So it should be common sense that using your pre-workout more frequently will help mix-it-up and prevent it from going 'bad'. Not only that, it'll make you buy fresh pre-workout supplements more frequently too, so you'll suffer from this problem much less. Think about it; pre-workouts usually come in 20-30 serving containers. So they're designed to be fully consumed in the space of 1-3 months - not left on your shelf for 3 months! If you haven't just skimmed through this whole article, then you should have learned some valuable information here. Ultimately, by saving your pre-workout powder from turning hard or clumpy, you're also saving yourself money too; no-one wants to replace their pre-workout with a new product just because it's gone hard. We always use our blender to fix hard or clumpy pre-workout. Those that don’t have a blender might want to try using a fork to break-up their clumpy powder. But before it turns bad, try storing it in the fridge.